Yellow_A8_Envelopes_-_5_12_x_8_18 is rated 5.0 out of 5 by 2. Rated 5 out of 5 by jackie2757 from GORGEOUS ENVELOPES These envelopes were exactly what I was looking for. The color was beautiful and the quality great! Rated 5 out of 5 by JBers from Yellow recycled paper envelopes I needed yellow envelopes at a good price since I am doing mailing of 300 to 400 at a time for a political campaign. Excellent quality and a fair price but shipping and handling was a bit high. I'm ordering envelopes for my upcoming wedding. Is it possible to have you send me a few different color envelopes so that I can match them to my invitation before purchasing a large amount? I would pay for the single envelopes. This envelope is bananas B-A-N-A-N-A-S! Again! This envelope is bananas B-A-N-A-N-A-S! 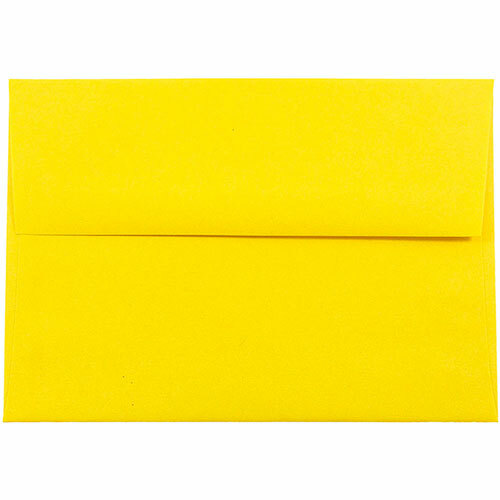 Gwen Stefani loves our A8 yellow envelopes. She sings about them so much that sometimes even JAM Paper gets annoyed. Just kidding, we love her and we love that song. We also heard that you were talking about our envelopes, and you didn't think that we would hear it. But we did, and we are SO fired up now! Gwen is too, especially when she looks at these envelopes. The color just reminds her of her most classic song and she starts singing! So hollaback girl if you love these envelopes as much as she does! Send some Gwen Stefani (or No Doubt) tickets to your friends using these envelopes and make sure to write a note with them saying this night's going to be bananas! Side note: let's just all admit this now... she totally taught us how to spell that word. So let’s all write a letter to her saying thanks. Yellow A8 Envelopes measure 5 1/2 x 8 1/8. Available in: Yellow Brite Hue Recycled, Straw Passport Recycled, and Parchment Antique Gold / Yellow envelopes.